LOS ANGELES, California (CNN) -- Two firefighters died Sunday battling a wildfire in Los Angeles County, according to Deputy Fire Chief Michael Bryant. 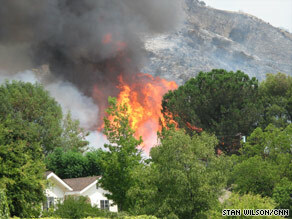 Flames come dangerously close to homes in a La Canada Flintridge community on Sunday. Meanwhile, three people hurt in a growing wildfire were burned because they "did not listen" to orders to evacuate, Gov. Arnold Schwarzenegger said Sunday after declaring a state of emergency. "I want to urge everyone living near any of the fires, please, listen and follow evacuation orders from local officials. They will not tell you to evacuate if it's not necessary," he said. "Listen carefully -- there were again people that did not listen and people that got burned and really badly injured because they did not listen." The wildfire's fierce flames are putting more people and homes at risk as the strongest part of the Station fire moves northwest of the forest toward Acton, California, Jennifer Sanchez of the forest service told CNN. Evacuations for some Acton residents are in place, she said, and some off ramps of Antelope Valley Freeway, also known as the 14 Freeway, were closed. Three people suffered burns while in the Big Tujunga Canyon recreational area of the Angeles National Forest where three homes were also destroyed by the fire, said Bruce Quintelier, fire information officer for the U.S. Forest Service. At least 23 cabins also were destroyed, he said. In addition, two to three dozen recreational cabins were destroyed, said Randi Jorgensen, another forest service information officer. Mary Kohn, who lives in La Canada Flintridge, said the uncertainty of the progression of the fire is "unnerving." "You think, oh, it's calm, there's just smoke, it's no big deal," she said. "And then you see a big flare and it's scary." Another resident of the area told CNN she evacuated her hillside home for the second time last night. "My neighbors and I were trying to stay calm and suddenly the hillside absolutely exploded into flames," she said. "We thought our houses were gone. It was a very sleepless night." Fortunately, the flames spared her home, dancing around the perimeter, scorching the area from the sidewalk to the curb. No firefighters have been reported injured, but one was getting treatment for heat exhaustion, Quintelier said. Another fire in the Angeles National Forest has burned 2,168 acres, the Forest Service reported. The Morris fire started Tuesday and is 95 percent contained. The Morris and Station fire are among eight "huge" wildfires in the state, said Schwarzenegger. Dozens of fires have flared up this fire season, charring 55,000 acres, he said. Saturday saw 89 small fires start in the state, but they were quickly put out, he said. The governor also declared a state of emergency in Monterey County, where one blaze, called the Gloria fire, has burned 6,437 acres. Another called the Bryson fire has burned more than 3,000 acres, according to the forest service. Winds of more than 20 miles per hour fanned the flames, but "this fire's very different," Jorgensen said. "It's not what we typically get. It is not a wind-driven fire." Actually, if there were more wind, it would make it easier to fight the flames, Schwarzenegger said. The weak winds allow clouds to hover over the flames, making it more difficult for firefighters attacking the fire from the air to see the blaze. The fire has spread so vastly because there had not been a fire in that area in 60 years, he said, meaning more brush and more fuel. Forecasters say the Mediterranean-style climate of the central and southern region of the state help fuel the wildfires, along with triple-digit temperatures, dry foliage, low humidity and 20 mph winds. CNN's Irving Last contributed to this report.